In addition to our Standard Version ($289) which accommodates all your food and beverage vendors, we also provide distributor specific versions for all national and many regional food service distributors throughout the US and Canada ($359). The distributor versions can still accommodate all your other vendors, and are not limited to the designated vendor. With these versions you can import your food and beverage items directly from an order guide provided by that distributor! Depending on the distributor you select, you can export the order guide directly from the Distributors web site or request the order guide from your Sales Representative or the companies IT Department. Instructions to obtain each are provided in the EZchef HELP section documentation. These order guides are unique to your establishment and contain only the items that you purchase along with your pricing. Most distributors update their order guides weekly so you can import yours as frequently as that, or whenever you like to update pricing and add newly purchased items. The program will be available for immediate download after the purchase is complete. 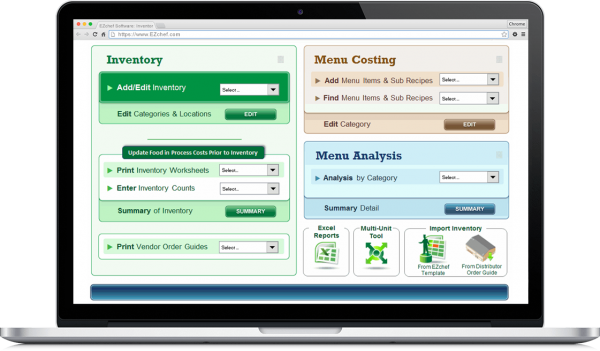 EZchef Software: Inventory Management, Menu Costing and Analysis for Restaurants. NEW v4.40 introduced for 2019 by the Restaurant Resource Group. *This program requires the Windows version of Excel 2007, 2010, 2013, 2016, 2019 or Office 365; and is not compatible with the Mac OS because it includes “macros” (programming features) written in the Windows version of Microsoft Excel . EZchef can be run on the “virtual” hard drive of a Mac computer with appropriate software installed (e.g. Parallels, Windows (XP/Vista/7/8/10) and the Windows version of Excel.